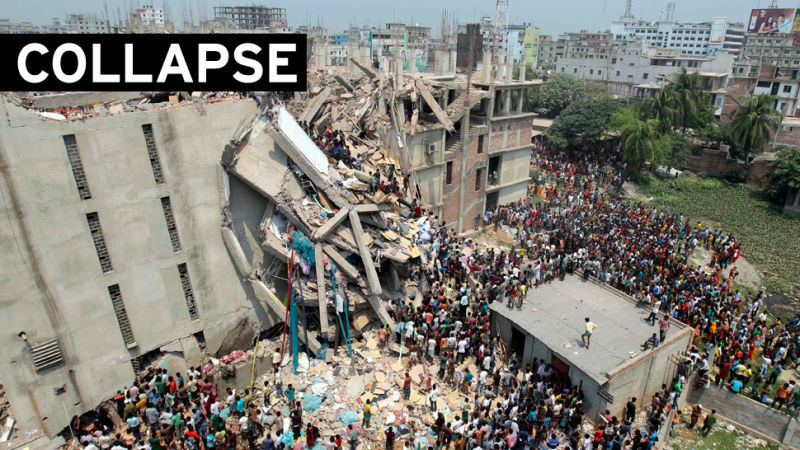 A day after cracks were discovered in the building's edifice—but supervisors forced workers to work anyway—an eight-story garment factory and commercial center in Bangladesh collapsed, killing at least 70 people and injuring hundreds more. The disaster is the latest in a string of horrific workplace accidents at facilities owned and operated by the country's garment industry, which is among the world's largest—and cheapest. Dozens are said to still be trapped, and more than 600 injured, following the Wednesday-morning collapse, and rescue and relief efforts are ongoing. The building, which housed four garment factories employing some 5,000 people in addition to shops and a bank, had developed cracks on Tuesday, but workers told local news outlets that managers required them to attend work on Wednesday anyway. Industry proponents say the garment industry has been an essential engine for the Bangladeshi economy, lifting millions of people, particularly women, out of abject poverty, even with such low wages. Today, garments represent roughly 80 percent of Bangladesh’s manufacturing exports and provide a critical source of foreign exchange that the government needs to help offset the high costs of imported oil. But critics have blamed the Bangladesh government, factory owners and global brands for doing too little to protect workers with safe working conditions or to pay them a livable wage. Labor unions are almost nonexistent inside garment factories, and a labor organizer, Aminul Islam, was tortured and murdered. His death remains unsolved.